Thanks. Yeah, that's the same type of crash. I think I'll just make sure it doesn't crash when this event occurs. I don't think you'll be able to track down exactly what is causing it as it is most likely an OpenGL issue that's almost impossible to track down just by changing options and such, since OpenGL crashes don't always occur with much logic or consistency. Is this consistent behavior? For example, if you exit the game (i.e. close the game application completely) and then start it up again, does it still not crash with mouse constraint off? Does changing other options (for example switching between full screen/window mode) affect the crash? Does zooming in and out have any effect on the crash? Thanks for this. But it still doesn't crash for me. 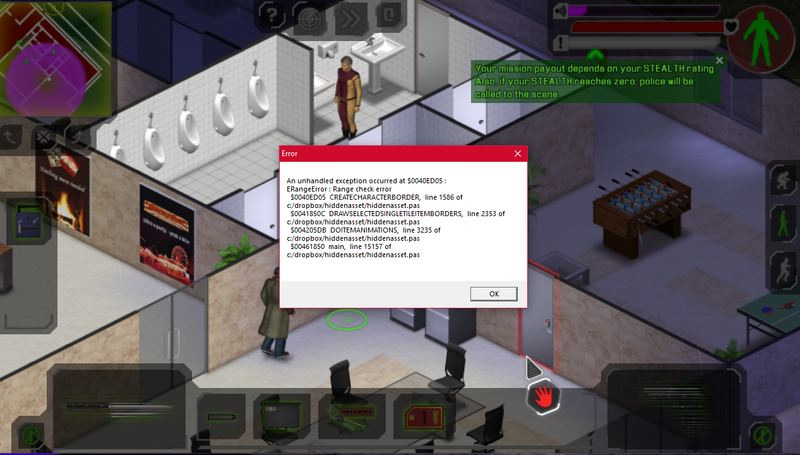 It could be an OpenGL issue as that is rather finicky and sometimes behaves differently on different computers. I will double-check all the OpenGL calls around the code that makes the selection outline. Okay. I'm still unable to reproduce the crash. BUT... I know why it crashes in that part of the code. When drawing the selection border around the selected object (the door, in this case), the code traces around the outline of the door. But for some reason, the door graphic isn't loaded properly, so the code tries to trace an outline around nothing. That's what causes the crash. I just don't know why the door graphic isn't loaded properly for tracing around. But I can still change the code so that the crash doesn't happen, i.e. fixing the symptom rather than the disease. Does it happen with any device or only the miniature hydraulics? Which door (and on which map?) is the miniature hydraulics attached to? Not yet. From where in the code it crashes, it seems to be an issue with creating the selection border (the colored outline around the selected object), but I haven't been able to replicate the crash or figure out what's causing it. Does it only crash when you select a specific door? Does it also crash when you don't have a weapon/device in use? What game resolution are you running at? Thanks for reporting this! Was the miniature hydraulics on the door you tried to unlock with the keycard or was it on a different door? EDIT: Oh, the light isn't on on the miniature hydraulics, so looks like it wasn't attached to a door on the current map. I suspect the hydraulics may not have anything to do with the crash. Will have to do some tests.